Sound funnels into the ear canal and causes the eardrum to move. The eardrum vibrates with sound. 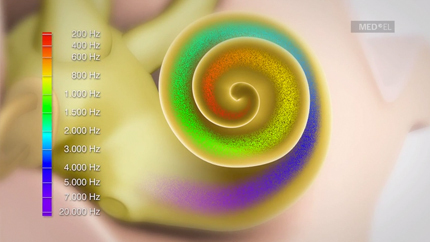 Sound vibrations move through the ossicles to the cochlea. Sound vibrations cause the fluid in the cochlea to move. Fluid movement causes the hair cells to bend. Hair cells create neural signals which are picked up by the auditory nerve. Hair cells at one end of the cochlea send low pitch sound information and hair cells at the other end send high pitch sound information. The auditory nerve sends signals to the brain where they are interpreted as sounds.